The stakes are high for students unlucky enough to be caught in the crossfire. Rolisa is a married mom with four kids. Two of them are successful graduates of Chicago’s public schools—her eldest graduated from college in 2011, and the second is a college junior. Her younger kids are in the fourth and sixth grades at a small public school on the South Side. The class sizes are at the city average, and the test scores are above the state average. Her kids are pretty happy there. Or at least they were, until the standoff between the Chicago Teachers Union and Mayor Rahm Emanuel transformed them into students of Rolisa’s makeshift kitchen table school. As the strike loomed, Rolisa secured a curriculum from her kids’ teachers, coordinated with other working parents and enlisted her eldest daughter. But even with this preparation, the strike was a harrowing time for her. Rolisa suffers from COPD, a serious breathing condition. As a result, she works from home, which made her impromptu home school possible but not easy. In addition to the exhausting days and the financial burden of hosting and feeding neighborhood kids every day, the uncertainty of when and how the strike would end kept everyone on edge. Rolisa worried about the dangers teens in her community might encounter during days of unstructured idleness. Like the majority of Chicago parents, she sided with the teachers, but she was frustrated and worried about her children’s short- and long-term prospects. Listening to Rolisa describe her son’s future in such precarious terms made me realize just how lucky I was to be born when I was—in the early 1970s. It was a moment when the civil rights and women’s movements opened new job opportunities for my parents. I started kindergarten when it was still the norm for all parents in the neighborhood—even those with more disposable income—to send their kids to the local public school. There was a private school in town, but I’m not sure who went there. It was the South, but this was just before white flight became a perfected strategy of resegregation, so I learned in racially and economically integrated classrooms. My teachers were paid a living wage, so they worked just one job, not two. They had time to offer extra help after school. In high school I had art, orchestra and sports—none of it cost extra. These were neighborhood schools, so I could walk or take a bus, and my single mom didn’t have to take time from work to get me to and from school and events. The schools weren’t great, but they were safe, and there were just enough extraordinary teachers to keep me challenged. Local businesses sponsored the football team, but no corporation sought profits from competing with our public schools. I ended up with a full scholarship to college, because universities still had affirmative action. I graduated into an expanding economy. I worked hard, but it’s obvious that the dumb luck of my birth year undoubtedly contributed to my professional and personal accomplishments. I’m not alone. As Brian Miller and Mike Lapham argue in The Self-Made Myth, successful people are only partly responsible for their accomplishments. Publicly financed infrastructure, property laws, favorable tax structures and social safety net programs are all crucial for entrepreneurs. In addition to these factors, personal accomplishment is also strikingly influenced by the random luck of when you’re born. Drawing on research from Malcolm Gladwell, Miller and Lapham report that “of the 75 richest people in all human history, 14 were Americans born between 1831 and 1840.” When we are born determines whether we come of age in a recession or in an expanding economy, during peacetime or in the midst of a draft, at a moment when our identities limit our civil rights—or not. The conditions I faced as a schoolchild felt ancient, natural and permanent, but they were not. Widespread, integrated, quality public schools existed for only a brief moment. They were decimated by the original “school choice” movement—when middle-income white families fled cities for suburbs and public schools for private ones. School evaluations were once the subject of heated PTA meetings; now they come from remote bureaucrats who make demands from on high without providing adequate resources. As a nation we are paralyzed by the complexity of measuring achievement, and we’ve retreated to the blunt tool of high-stakes standardized tests. Which brings me back to Rolisa’s kids and their 350,000 peers. At press time, the Chicago Teachers Union voted to end the strike, tentatively agreeing to a new contract. Chicago’s children will soon be back in class—but the underlying issues are far from resolved. Reformers will continue to push for teacher evaluations based on student test scores; teachers will argue that such assessment tools must account for the poverty, dislocation, violence and incarceration that affect so many of the kids they teach. We can expect what happened in Chicago to repeat itself in other cities. Afghanistan and Iraq, not just the heavily armed wars in their own streets, but the wars between the leaders and teachers who are supposed to have their best interests at heart but who seem willing to allow this generation to be lost. 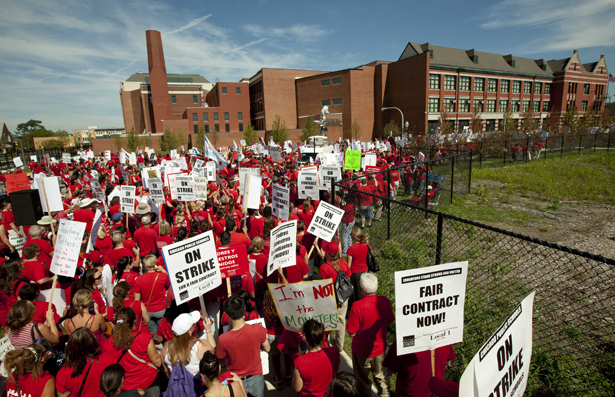 Also in this issue, Pedro Noguera details “What’s Missing From the Chicago Strike Debate.” Earlier this year, in our special Occupy the Safety Net issue, Noguera wrote about the struggles of a West Oakland school, hit by the double whammies of poverty and austerity.